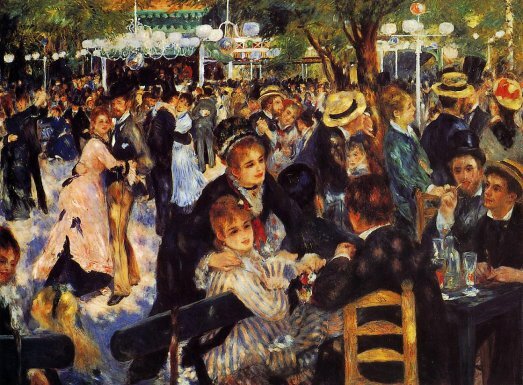 Impressionists painted scenes of modern life but in none of the artists' works did the general air of celebration, joie de vivre prevail, as in Renoir's Moulin de la Galette. It is easy to see from this painting why Renoir was known as the Romantic Impressionist. It is a crowd of happy people, talking, drinking, dancing, basically having a good time. 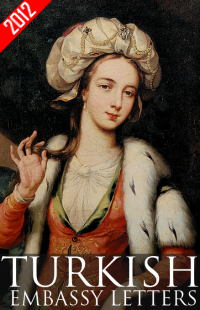 It is almost an antithesis to the issue of disconnect - the female in the foreground has her arm around another whose head is touching her shoulder, everyone seems to be engaged with their companions, looking, leaning towards them in a gesture of genuine interest. Even though there is a chair at the foreground of the painting, the viewer is till invited into it. Renoir was an optimist and this painting, alone could probably be looked at as the primary evidence of this. All the components of the painting from the composition to the color pallet to the brush strokes evoke a joyous, optimistic feeling. Renoir used intense, vibrant colors, hues that are associated with a happy and positive mood. His composition is unified with the use of dark colors like bright blues and violets which jump all over the canvas, fusing with the warm pastels. His typical, hazy brushwork adds to the energy of the composition. There are no sharp angles, everything is soft and curving. The reflections of light on the figures and the dance floor help to unify the composition as well. This 6 foot canvas has the feel of being painted right there on the spot, en plen air, but was most probably worked on in Renoir's studio. He has successfully created a fresh and natural scene. The modern invention of gaslights which allowed people to stay out at night can be seen throughout the painting. Moulin de la Galette was an old mill on top of the hill, Montmartre, that was converted into a cafe, restaurant and dance venue. Renoir painted this picture before it had become a popular place to go for entertainment. At this time it was a favorite of the working class young people to go dancing where they had Sunday balls from three in the afternoon till midnight. Renoir placed young working class females and middle class artists in this idealized scene; these were his typical models most of whom were his friends. There is no sense of amoral behavior going on, just young men and women having a good time. The women portrayed are seamstresses, milliners, florists and workers, wearing pretty dresses, come out to go dancing on a Sunday afternoon. These were the actual clients of this establishment that Renoir had to cajole by giving little gifts and courting their mothers to allow them to pose for him. As a result there is no sense of prostitution but a clean, country innocence portrayed in this painting as opposed to the cynical approach of Degas in his backstage of the ballet paintings. Renoir came from a working class background himself, which probably helped him to identify with the people he portrayed here. This was a time when after France's humiliating defeat by Germany and the horrors of the Commune, the French people needed an escape and gaiety. Renoir gave them his own vision of the joi de vivre of the young working class people full of life and promise. Thanks for your beautiful description.